If your members are looking for ways to ramp up strength, tone muscles and burn fat, heavy ropes are the right choice. 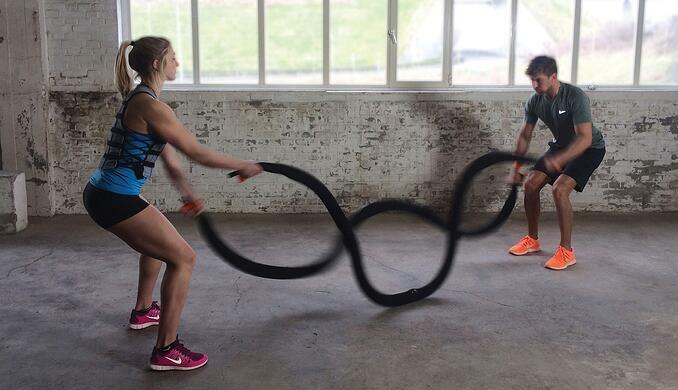 Heavy ropes are quite unconventional yet extremely effective. This is the exercise solution for members tired of repetitive workouts. It is also perfect for those looking to work an array of muscles while having plenty of fun. Who First Used Heavy Ropes for Training? Heavy ropes were originally used as a training method for American football players and Mixed Martial Arts fighters. Heavy ropes have spilled directly into the mainstream of exercise scenes across the globe. This is an effective, affordable and simple means of improving conditioning. The benefits of rope training include increased power, strength, flexibility, and endurance. The end result of consistent heavy ropes workouts is toned muscles and burned fat. A few whips of these heavy ropes propel one's heart to its maximum rate. This is the type of intense workout just about everyone can benefit from. Heavy ropes workouts are extremely simple. All members need is a heavy rope and an anchor. That's it! There is no need for expensive workout equipment, machinery, and other sundries. The best heavy training ropes are Stroops The Beast 20' Battle Rope, Stroops Son of the Beast 10' Battle Rope and the Hyperwear SandRope Battle Rope. Every heavy rope workout requires an anchor to keep the rope connected to the ground or another object. Tie your Hyperwear SandRope Battle Rope around it so you have two even lengths for each of your hands. Members can even use a workout buddy as their anchor. One member can grab the rope's middle section and hold on while another member swings away. As long as this individual is strong enough to withstand your fury, he will serve as a formidable anchor. What Are the Benefits of Heavy Rope Training? Most people grow tired and bored with their workouts. You can only do the same exercises so many times before they feel stale. Furthermore, people tend to plateau after completing the same workout several times over. Make use of heavy ropes and your exercise sessions will feel much more dynamic. Heavy rope exercises are somewhat irreverent as they are so unique. This idiosyncratic training technique injects life back into exercise. The techniques also work all sorts of different muscle groups and get the heart going. Whether members are looking for a fun and exciting new way to work your arms, core, shoulders or heart, heavy rope exercises are the answer. Heavy rope exercises are quite diverse. Members can use these large ropes in an endless number of ways. Examples of popular heavy rope movements range from whips to throws, spirals, slams, and waves. Each of these exercises involves swinging the arms up, down, and side to side in various manners during timed intervals. Your gym members will see the most benefit from this workout by going hard from beginning to end. They should maintain a high level of intensity throughout each motion. If they feel the burn, that is a good thing! The burning sensation means members are enhancing strength, toning muscles, and burning away the fat. If your members are not exactly sure where to start, they can jump right into three sets that last 30 seconds each. Be sure to recommend a minute of rest in between each set. They can gradually heighten the length of their heavy ropes sessions as they build strength and improve conditioning. It is important to establish a solid base by positioning your feet in line with your shoulders. Stabilize your core while you swing side to side and up and down. Maintain this technique throughout the duration of your heavy ropes exercises. Members will find that the workout serves to engage the shoulders, arms, core, and just about every other part of your body. Heavy rope training is quite intense. It takes significant effort to throw these large ropes around. This exercise requires one to use his full range of motion. Opt for an array of directional strokes and your range of movement will benefit your core strength as well as your balance. Heavy rope swings with the Stroops Son of the Beast 10' Battle Rope work just about every muscle in the body, boost metabolic heart rate and burns away the calories. Heavy ropes are also a form of resistance training that safeguard muscle mass and boost overall strength. This workout even provides psychological benefits as it generates significant levels of hormones that boost metabolic activity. The excess post-exercise oxygen consumption keeps this rate sky-high for upwards of three hours. This phenomenon is referred to as the “afterburn effect”.